Psittacosis is a disease associated with birds that can result in a flu-like illness or serious pneumonia in many people who become infected. The disease is caused by a tiny parasite called Chlamydia psittaci. 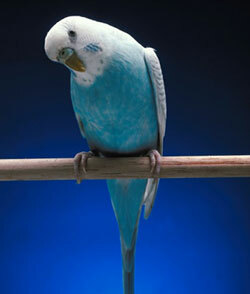 Parrots, parakeets, and other birds can be carriers of the organism and can transmit the disease to humans. Psittacosis could also be used as a bioterrorist weapon. The symptoms of psittacosis may include fever, headache, rash, loss of appetite, vomiting, neck and back pain, muscle aches, chills, fatigue, upper and lower respiratory symptoms and cough. In severe cases, extensive pneumonia may develop and be fatal (rarely). The symptoms commonly start 4 to 14 days after exposure to the blood, tissues, feathers, or droppings of infected birds. Birds can appear diseased or seemingly healthy and can shed the agent for weeks or months. You get Psittacosis from handling the blood, tissues, feathers, and wastes from infected birds. This might occur in pet shops, zoos, and slaughter houses. Infected birds could be obviously sick or apparently healthy. You can also get it indirectly by breathing in dust particles from the dried droppings of infected birds. Person-to-person spread is very rare. Most diagnoses are established by clinical presentation and positive antibodies against C. psittaci in paired sera. Your physician can order these tests. Medications can be prescribed by a doctor to treat psittacosis. Tetracyclines are the treatment of choice.There are no vaccines available. Infection does not provide permanent immunity to this disease. There are no vaccines available. Infection does not provide permanent immunity to this disease. Bird owners, aviary and pet shop employees, poultry workers, and veterinarians. Outbreaks of psittacosis in poultry processing plants have been reported. Avoid keeping birds as pets. If birds are kept as pets, clean the cage frequently so that bird droppings do not dry up and become airborne when disturbed. Do not buy, sell, trade, or handle birds of the parrot family imported from foreign countries without proof that they were placed in quarantine before being sold; it is the law. Psittacosis is an URGENT notifiable condition and must be reported by phone to the Disease Outbreak Control Division, Disease Investigation Branch on Oahu, or to the District Health Office on the neighbor islands as soon as a provisional diagnosis is established.